Mechelen Zandpoort Youth Hostel is located on the edge of Mechelen city center. It's a very modern building with sober, but well equiped rooms. In the neigbourhood you'll find many cafés and restaurants. This is definitly the place if you want to go for a drink in the evening. Kenny Duffus visited this hostel and took some pictures of the rooms. Location on google maps including driving direction for bikers. You can walk from Mechelen train station to the hostel by staying parallel to the train track while heading North-by-North-East. With the Station behind you and café Friends before you, turn right and keep walking in this direction. Then over the pedestrian bridge and further along "Raghenoplein". You should keep to the right side of the road at all time. The hostel is past the big building of the "Katholieke Hogeschool Mechelen". 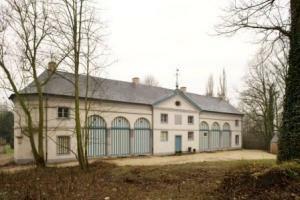 Roosendael is an ancient abbey site which was converted into a private estate in the 19th century. Since 1960 it is a youth hostel for schools and youth associations. Today many different organizations, families, companies biking groups and hikers use it's variant offers. "Het Koetshuis" is the 18th century building that is reserved exclusively for KDE participants. It has be very recently renovated to the latest comfort with beds for 44 people, on suite bathrooms and even a meeting room. From Mechelen main station you can take the bus to "Walem Kerk" (the church in the town of Walem). With bus 500 this takes 20 minutes. From there walk back in the direction of Mechelen about 150 meters and take a left turn into the "Lange Zandstraat". After 700 m you'll see the entrance gate at the end of a short cobblestone road on your left. See the local section on the travel page for detailed maps of the bus lines in and around Mechelen. location: Mechelen city center, near "Vismarkt"
travel time:15 min. walk to central station or 5 min. by bus to central station. 9 minutes by train to Sint-katelijne-Waver. travel time: 5 min. walk to Nekkerspoel station, 7 minutes by train to Sint-Katelijne-Waver. 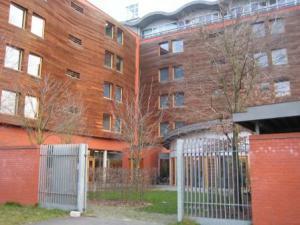 location: Mechelen city center, near "Korenmarkt"
travel time: 15 min. walk to central station or 5 minutes by bus. Then 9 minutes by train to Sint-Katelijne-Waver. travel time: 10 min. walk to central station, 9 minutes by train to Sint-Katelijne-Waver. travel time: Depends on location. B&B's in Sint-Katelijne-Waver within walking distance.